There are segments of the Russian population that, even in a politically inclement environment, bravely voice their open opposition to Russia’s military involvement in Ukraine. Organizing independent political action has never been easy in modern Russia. However, since the anti-government protests and the return to the presidency of Vladimir Putin in 2012, political organizing has faced even greater bureaucratic hurdles and harassment by security forces while activists are subjected to physical threats, intimidation, arrests and sometimes targeted killings. Having skillfully navigated anti-Ukrainian and anti-western propaganda, and benefiting from Russian hyper-nationalism over the past several months, Putin launched in early spring a territorial expansion and overt intervention campaign in Ukraine. By October 2014, amid national fervor, he was not shy about bragging, “I am the biggest nationalist in Russia,” presenting himself as the national flag pole that Russians could rally around. Putin has enjoyed significant public support — as much as 88 percent, according to a recent survey by Levada Center (see also this secondary source in English). Roughly three-quarters of respondents expressed positive views particularly of Putin’s policies in Ukraine. This nationalism-boosted unity has allowed Putin to shrink the civic space in Russia even further, under the pretext of fighting imaginary fifth columns and foreign agents. At a time when independent voices are being silenced, and polls are still indicating significant support across Russia for Putin’s policies, the international community perceives Russian society as either quiet and passive at best or devotedly loyal to the Kremlin leader at worst. Nonetheless, there are segments of the Russian population that, even in a politically inclement environment, bravely voice their open opposition to Russia’s military involvement in Ukraine. These diverse social groups and individuals have deployed numerous creative nonviolent actions to protest the war, break through Kremlin propaganda, and alter the public mentality about the international illegality of Russian armed involvement in its eastern neighbor’s territory. Although dispersed and seemingly limited or weak, these actions should not be overlooked by observers inasmuch as the Kremlin does not ignore them but rather uses state repression and propaganda against them. These small, often innovative acts of resistance offer lessons in civic organizing and solidarity that actors on the ground might use in future actions. This is the story of the potential harbingers of grassroots mobilization and civic opposition in Russia in the months to come. Soon after “little green men” began appearing in Crimea at the end of February 2014 it became obvious to some Russians that Putin had launched an undeclared conflict with Ukraine. At the beginning of March, small anti-war rallies were held in Moscow and St. Petersburg. People expressed their opposition against Putin and his plans to turn them into “cannon fodder.” Between 300 and 360 protesters were arrested in the capital on March 2 as they demonstrated and sang the Ukrainian anthem. On September 5, people gathered as far away from the Russian capital as Tomsk, a Siberian city, albeit in smaller numbers (more than 30 people). 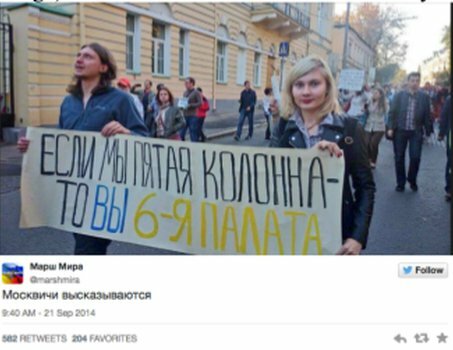 Carrying posters and shouting slogans, the activists aimed to raise public awareness about Russian aggression. The most recent and largest demonstration this autumn was the March for Peace on September 21. The date was chosen strategically as it coincided with the UN International Day of Peace. In Moscow an estimated 26,000 people went out on the streets. Thousands demonstrated in St. Petersburg and other cities around Russia despite the fact that the authorities did not sanction the rallies. All major opposition parties joined the demonstrations. 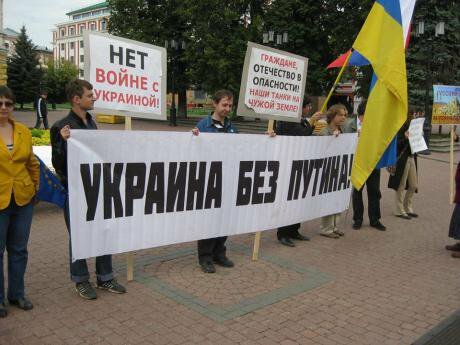 The main slogan of the marches was “Putin, enough lying and making war!” Other banners were “No Putin – No War!”, “Russia without Putin, World without War!”, and “If we are the Fifth Column then you are the Sixth Ward,” (see image) in reference to Chekhov’s famous story of “Ward No. 6” about a madhouse. Russian demonstrators must secure authorities’ permission to hold a protest, otherwise they risk arrest. In order to circumvent tight government control on street demonstrations, Russians have picketed individually against the aggression in Ukraine. It is often easier to avoid arrest and show that detention is illegal and unjustified, since a solitary picketer is not equivalent to a demonstration according to the law. At the end of August a number of lone protesters from the Russian intelligentsia held a series of single pickets on the streets of Moscow and Yekaterinburg to demonstrate their opposition against Putin’s war in Ukraine. Each of them took turns standing along Tverskaya Street, the main street in the center of Moscow holding posters. One of them was Victor Shenderovich, a popular Russian writer and satirist. 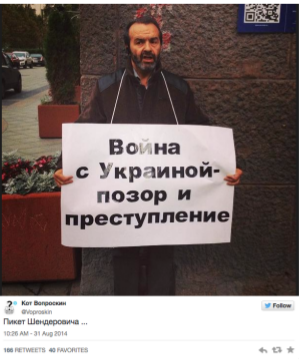 He held a sign that said, “War with Ukraine is a shame and a crime” (see image). Protesters of diverse and politically unaffiliated groups engaged in lone picketing for peace all over Russia, including St. Petersburg, Tomsk, Kaluga, and Bryansk. 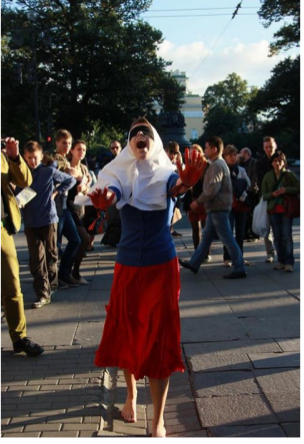 In St. Petersburg, a blindfolded young woman activist took a walk dressed in colors of the Russian flag, with outstretched hands painted red to symbolize blood. Around her wrists were St. George ribbons, a Russian state symbol appropriated by the Russian and pro-Russian rebels in Ukraine. She screamed loudly as she wandered along the Nevsky Prospect until the authorities called an ambulance, but not before she attracted a large crowd of onlookers, taking photos that they disseminated widely on social networks (see image). In 2013, the Pew Research Center’s Global Attitudes Survey had found that 66 percent of Russians use the internet occasionally or own smartphones, of which 77 percent access the internet on a daily basis. The Russian online communities of VKontakte and Facebook have become platforms for discussion and the exchange of information about anti-war activism and related announcements. For example, a VK group Protest Actions has more than 8,700 members and the Russians Against War community on Facebook has collected more than 14,500 likes. Twitter is also used for communicating and gathering support for anti-war organizing and campaigns. Solidarity movement activist Dmitry Monakhov’s tweet (“I am a Russian citizen. Not cattle. Not a killer. And not an occupier. I am ashamed of my President Putin. At 9.00 I will go to Manezh in action against war”) was retweeted more than 3000 times (see image). His subsequent arrest and jailing for 15 days backfired and led to an outpouring of popular support for his protest actions on social media. The band members are dressed up in white suits that turn into red — soaked with blood — in the latter part of the video clip. The song ends by zooming out to expose an enormous red, puddle-like road in which the band stands. Another Russian rock legend Andrei Makarevich has angered the Russian regime after performing in August in Ukraine in front of refugees, including children who fled the Donbas region. In response, his scheduled concerts were cancelled across Russia while some politicians and journalists labeled him a “friend of the junta,” a “Nazi collaborator,” and “a traitor,” and even called for exiling him and stripping him of his state awards. Makarevich then wrote a blog post for the online magazine Snob.ru describing the dismal living conditions in Slavyansk under rebel control, humanitarian work done by the Ukrainian volunteers, and refugees’ suffering. In response to the ban on his concerts in Russia, Makarevich wrote a new song about those who become inconvenient to others because they no longer want to be silent. The song was viewed more than 750,000 times on YouTube since October 24 when it was posted. Similarly, Diana Arbenina, a member of the rock band Night Snipers, had her concerts canceled in a number of Russian regions because of her public support for Ukraine. 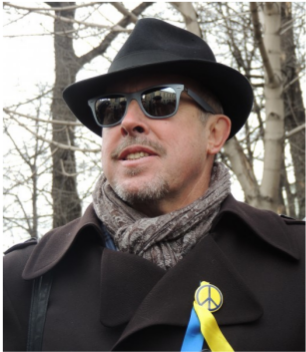 Russian rock-star Andrei Makarevich wears a ribbon with the Ukrainian national colors. Image from Wikimedia Commons. Some rights reserved. A number of Russian and Ukrainian musicians came together to write and perform a song “Women are tired of giving birth to soldiers” addressed to the mothers of Russian soldiers. The song brings attention to the immoral nature of war. The taped television screen in the video clip symbolizes Russian propaganda. The song is in both Russian and Ukrainian, performed by Russian bands Enotov Brothers and Ariel from the Urals; the Russian musician Gary Ananasov; the Ukrainian Revenko Band; and the Italian guitarist Rudy Rotta. The YouTube video has collected more than 160,000 views since it was posted. Some Russian artists have used their artistic skills to bring greater awareness among the general public about the war and its one-sided political coverage in the Kremlin media. Graffiti (such as “Crimea - is Ukraine”) written in the Ukrainian national (blue and yellow) colors have appeared on sidewalks, entrances to subways and embankments in Moscow, together with graphic art of the Malaysian passenger flight shot down and the inscription “Made in Russia” (see images). On the evening of August 31 near the railway station Kyiv in Moscow, activists planned to light around 3,000 candles commemorating the number of people killed in the Donbas region. Moscow police thwarted this attempt and arrested the participants, though some candles were still lit. On October 7, Vladimir Putin’s birthday, activist Denis Bakholdin dedicated his artistic performance to the Russian leader. 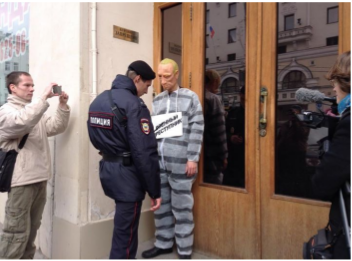 He walked along Manezh Square, one of the main streets in Moscow, wearing a mask of Vladimir Putin and dressed in a striped uniform with a sign saying “war criminal” around his neck (see image). He attracted attention from passersby, who were enthusiastic about taking photos with the “criminal.” Bakholdin’s actions landed him in police detention. Since the Kremlin tightly controls Russian state media, some ordinary Russian citizens have begun to take news production into their own hands. An online TV channel Sotnik-TV, which has a YouTube channel, a Facebook page, a Twitter account, and a website, is run by a couple, reporter Sasha Sotnik and his wife Mariya Orlovskaya. The Sotniks are known for their outspoken criticism of Putin’s policies. They interview both well-known figures and people on the streets about their views on political issues. Their recent video campaign was in support of the Peace March on September 21. They have recorded a series of video appeals from famous Russians, including writer Lyudmila Ulitskaya, theater and film director Vladimir Mirzoev, actor Maksim Sukhanov, and poet Lev Rubinstein who encouraged people to join the march. Some Russians have coalesced around various professional and civic anti-war groups. One of them is the Congress of the Intelligentsia, which is “against the war, against the isolation of Russia, against the restoration of totalitarianism.” The group published its first anti-war appeal in Novaya Gazeta in March. Some of the individuals who signed the Congress appeals include writers from the Russian PEN Center and the Human Rights Council, which brings together leaders of human rights organizations, as well as filmmakers, scientists, environmentalists, and many others. An excerpt from one of the recent Congress appeals published in September reads: “The Congress of the Intelligentsia calls upon Russian citizens to support anti-war actions and initiatives and to unite in a broader anti-war movement.” The group also issued an open letter appeal to Konstantin Ernst, the general director of the Channel One Russia, the largest broadcaster to protest harmful state propaganda about the events in Ukraine. 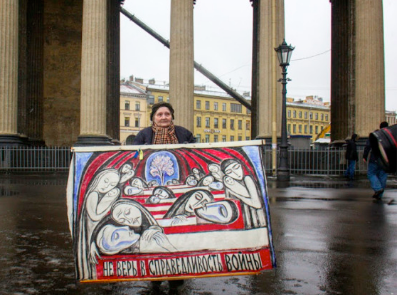 Yet another civic organization whose roots go back to the last days of the Soviet Union — the Union of Soldiers' Mothers of Russia with more than 100 branches across Russia — took a public stance against Russia’s involvement in the war in Ukraine. In an interview with Obozrevatel, Lydia Sviridova, Chairman of the Union, Saratov branch, explained the group’s latest activities to break the informational blockade imposed by Kremlin-controlled media. Many Russian soldiers who were eventually sent to fight in Ukraine have been informed that their deployment is in connection with regular drills or exercises, not with the war. Therefore, according to Sviridova, her team tries to encourage mothers to call their sons who have already been deployed to find out their location. Afterwards their sons are asked to appeal to the unit commander on the grounds that they did not consent – which is required by military statutes – to serving on a foreign country’s territory. It is fair to conclude that Russian society is either not as intimidated by or supportive of the Kremlin and its policies in Ukraine as it might initially look. Different groups and individuals within Russian society took a public stance against military actions soon after Russian troops appeared on the streets of Crimean cities. Thousands of ordinary Russians, joined by filmmakers, writers, poets, artists, translators, journalists, and scholars acknowledge the risks of military action in Ukraine and the questionable morality of a war against a state with which the Russian people share history and culture. Recognizing the existence and the important work of the Russian anti-war groups and activists should become a priority both for Ukrainian civil society as well as those in other countries. This would allow various groups to initiate a discussion about the way Ukrainian civic actors could help their Russian counterparts in strengthening both their legitimacy and the anti-war messages that they bring to the fore. It could also help engage civic groups on both sides of the border in broader and coordinated solidarity campaigns. Russian and Ukrainian mothers of soldiers have already begun to do this on a limited scale. Such solidarity actions might aim to educate the public in both countries about the value and effectiveness of nonviolent organizing and actions against violence, as well as pressuring their respective governments to withdraw their troops, cease gunfire and shelling and allow civic groups and associations to re-emerge in Donbas. Ukrainian civil society could also become the key interlocutor for Russian civic groups. It could help to assess and advise about the most effective means of organizing and mobilizing ordinary Russians to reclaim civic space from an entrenched Kremlin, which, through its repressive policies, shows that it is apprehensive about the power of the people. Permission was sought and obtained for all images used in this article.